Welcome to PreciseShooter! How to make a sniper rifle. Part 6: Selecting a scope mount. How to make a sniper rifle. Part 6: Selecting a scope mount. 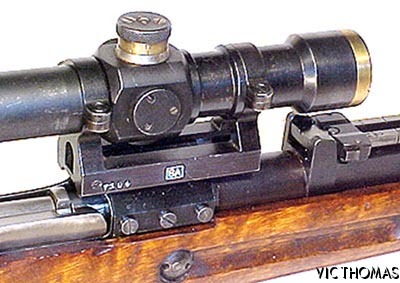 Mounting a scope is by far the most challenging issue when dealing with Mosin Nagants. The rifle was designed before scopes were used in combat, and made before they became accessible to an average soldier. In WWII rifle scopes were present on only a tiny percentage of weapons specifically designated as sniper rifles. This is why, unlike a typical modern military or hunting rifle, a Mosin you can buy today has no way of mounting a scope - the exception being "sniper" variants which I will discuss below. To mount a scope the rifle will need to be modified to various degrees, some scope mounts requiring more, and some less. In this post I discuss various mounting options in detail. I have already pointed out, in the buying section that you can get a "sniper" version of Mosin Nagant with the scope pre-installed for $400-$500. These are not actually true sniper rifles from WWII, but rather standard issue Mosin Nagants with a reproduction scope added recently. Judging from what I have seen at the range, these rifles can be spectacularly inaccurate (the dispersions I've seen with people shooting them were as bad as 10 inches at a 100 yards). There is a small number of authentic sniper rifles on the market with real WWII scopes. You should expect to pay around $800-$1200 for them. There are two types of military scopes for Mosin Nagant. The first one, used mostly in the late 1930s, was called PE. It has a 4x magnification, a German post reticle, a design that is similar to a modern rifle scope, and mounted directly on top of the receiver. The mount itself was attached to the receiver with 6 screws. 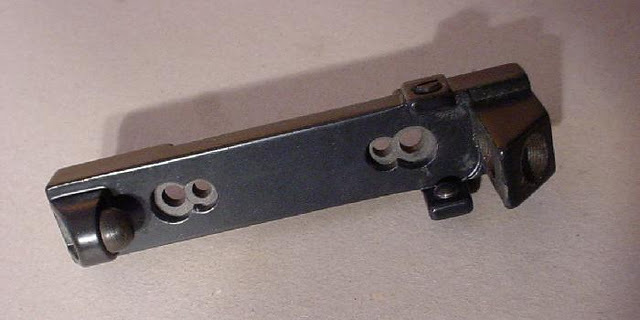 After the mount was attached, the iron sights could no longer be used. During the WWII this scope was replaced by a side-mounted PU scope. 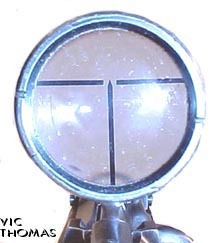 It has a slightly lower magnification of 3.5, and a "flat" design where the diameter of the scope tube is the same as the diameter of the objective. So it really only works with the original scope. The advantage of PU mount is the side rail which allows quick removal of the scope. Also, the mount allows the use of iron sights even when the scope is attached. However, installing the side rail requires modifying the stock. Both mount types require the use of a special "turned down" bolt, since when opened, the bolt handle sticks upwards and would interfere with the scope. This is true for any scope mount, except the scout mount discussed below. 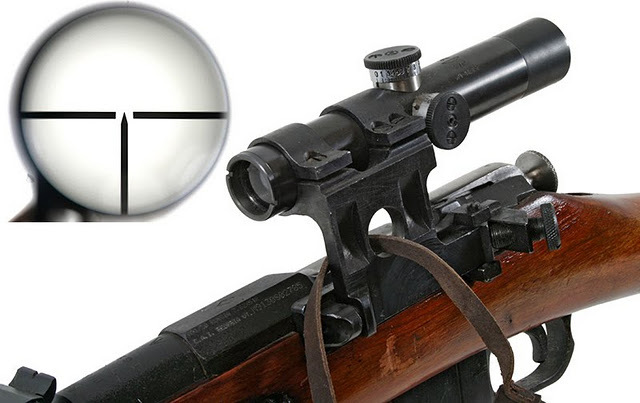 While "authentic" scopes can be interesting as historical pieces of militaria (unless, of course, you install them yourself using reproduction parts), they have many disadvantages when it comes to actual shooting. First, they have very low magnifications (3.5 for PU and 4 for PE). While it might be sufficient for human targets in the war, I hope that most people today would be shooting at paper, and you won't be able to even see a 1 inch target dot at a 100 meters with only 4x magnification. Second, when the scope is sighted to adjust for the difference in the direction of the scope mount and the barrel, since even a tiny level of non-collinearity will lead to large difference in point of impact, in a modern scope the field moves and the cross-hair stays centered. In these older designs the cross-hair moves, so you end up with it off-center, sometimes significantly off-center. For these reasons I do not recommend using PU/PE scopes and instead go with more modern alternatives. NOTE: There are after-market brackets that replace the very top of the PU mount with rings that can hold the standard 1" tube available on eBay. 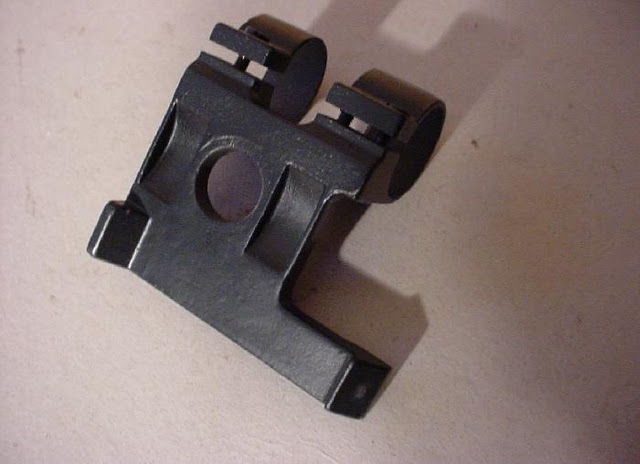 This allows using a modern scope with the PU scope mount. HOWEVER, the mount was designed for a small, light scope, and so the base of the scope (the distance between the rings) is rather small. 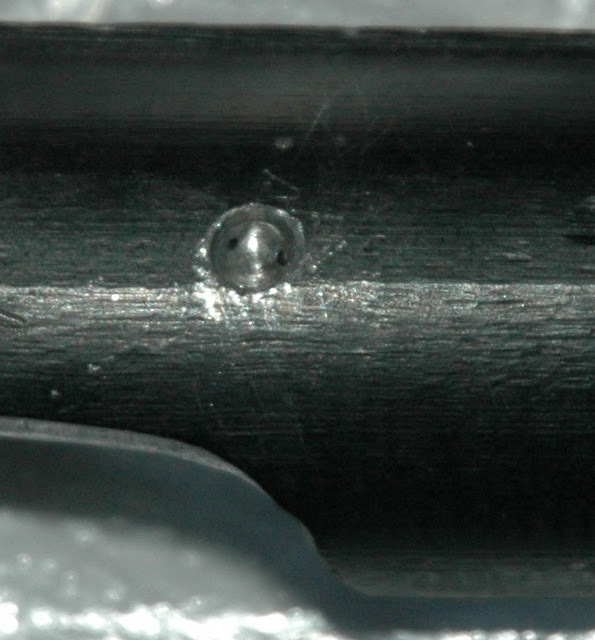 Mounting a large, heavy modern scope on these rings, coupled with a very heavy recoil of Mosin's 7.62x54r cartridge would almost certainly exert a very high stress on the scope tube, the scope will shake excessively, and will be more likely to fail. Scout scopes have a very long eye relief - the distance between the eyepiece and the eye - so the scope can be mounted forward of the receiver. For Mosin Nagant this setup is extremely convenient. The scout scope does not interfere with the bolt handle, so it does not need to be modified. It replaces the iron sights and is mounted using the hardware that goes into the iron sight mount - so there is no need to drill anything or cut the stock. The mount itself is just a cheap piece of metal and can be had for $12-$14 on ebay. Despite the ease of installation, I do not recommend it for the following reasons. First, the maximum magnification that is available in scout scopes is 7x. At this magnification most of 1" dot is covered by the cross-hairs at 100 yards, so getting to below 1 MOA is very challenging. Second, only very few scout scopes are available, mostly the cheaper ones, and the cheap scopes are known to not hold the impact point very well. Third, the mount itself holds on friction from several adjusting screws, and tends to come loose. It will certainly come loose after the first couple of shots, and you will have to remove the scope (because the adjusting screws on the mount are directly below it), retighten the screws, and remount the scope. This has to be done several times, and even after that I have doubts about how good the mount is capable of holding zero. Finally, the iron sights are removed with this mount and are not usable. This type of the scope is produced by an individual, not a company, and occasionally pops up on eBay for $80-$90. It consists of a base that is held on top of the receiver by a metal band wrapping around the receiver. This is another example of so called "no gunsmithing required" scope mount kits, the first being the scout mount. The only modification necessary for this mount is dremmeling out a tiny amount of wood from inside the stock to make space for the band. You still do need to modify the bolt handle because the scope mount hangs directly over the bolt, and interferes with it when the bolt handle is raised. I will write more about turning the bolt handle in the following article. This mount is easy to install and allows using any modern scope. However, it does not work. We can also order almost anything! When the receiver heats up when the rifle is fired, the expansion coefficient of the receiver metal is different from that of the retaining band. So the band gets stretched a little bit, and when the rifle cools back, it comes loose, so the screws that hold the band need to be retightened constantly. With every tightening the base slides alongside the receiver a little bit, and the impact point moves. I do not recommend using this scope mount at all. ATI kit requires drilling the receiver and replacing the bolt handle to install the scope. This is relatively demanding project, but it results in a mount that is better than any discussed previously. With this mount I have gotten pretty close to my 1 MOA goal. The kit consists of a bracket that gets screwed on top of the receiver, the bolt handle, and the hardware (drill bits, a tap, and screws) to get everything installed. It costs in the vicinity of $40. The bracket hangs very low over the receiver (which is a good thing, because the distance between the optical axis of the scope and the axis of the barrel is best minimized) so the standard turned down bolts do not work, and you need to use ATI bolt handle. The result does not look amazingly beautiful, but it does work. Because the bolt handle is turned down almost at the right angle and almost at the base of the bolt, the stock needs to be notched a bit to let the bolt close. The drill press is absolutely required to drill both the handle and the receiver - do not even think about doing this with a hand drill! It provides reasonable base that minimizes the momentum exerted on the scope during the recoil. It requires minimum modification of the stock. The result is reasonable stable and holds zero well. Aligning the bracket to the top of the receiver is very, very hard. Ideally, the bracket should be collinear to the barrel, but there is no way to actually measure this. Also, the top of the receiver is not necessarily symmetric, or aligned with the barrel, so the contact between the bottom of the bracket and the receiver will orient it in a direction you might not be able to control. When I installed mine, it was misaligned so much that I had to use adjustable rings to compensate (Millet, $30). The problem with these rings is that because of the ring design one cannot remove and reinstall them without losing zero, so the scope has to be permanently affixed to the rifle. This is the reason why I eventually gave up on this way of mounting the scope. You have to have a drill press. A cheap one (~$120) will do, but it is absolutely required. Aligning receiver in the vise on the drill press is hard. It has to be exactly perpendicular to the drill bit, and because it is curved, it is a non-trivial exercise. Drilling requires cutting oil which is not widely available (I was finally able to find it in Lowe's). Take extra care when tapping the receiver. If you turn too hard, or don't use cutting oil, the tap bit will break and you will end up with the hole that is plugged by a bit of hardened instrumental steel which is impossible to extricate. Overall, the ATI kit is an acceptable way to mount the scope IF you do not require removing and reinstalling the scope frequently (or you are extremely lucky and the shape of your receiver aligns with the barrel perfectly). This is by far the most expensive and the hardest to install scope mount, but it gives the best overall results. It does require not only drilling and tapping the receiver, but extensive modification of the stock, including refinishing. Once installed, however, a wide variety of scopes and scope mounts designed for Dragunov (and its AK clones such as PSL54c and Zastava M76) will work for your rifle. As I pointed out above, this is the hardest to install mount, but is preferred as far as quality and versatility of the outcome goes. I will cover the installation, including procuring all the parts, in the next post.